Pressing on trigger points (giving yourself a trigger point self-massage) can help release those tight muscle knots in your neck. Here’s how. Your neck muscles are so tight you could strum them like guitar strings. But this song is definitely not music to your ears. You’re rubbing and pushing and prodding your sore muscles – but is that actually helping? Or could you be making things worse? With the right simple steps, your tensed-up muscles can start whistling a happier tune. Chiropractor Chad Adams, DC, explains the ins and outs of trigger point massage. Muscle knots are those kinks in your back and the tight, ropy strands in your neck. Also known as trigger points, they are areas where your muscles have tensed up and refused to let go. “A trigger point is a muscle spasm — a signal from the brain saying, I’m not sure what to do, so I’m going to freak out and be tight,” says Dr. Adams. Trigger points form as a result of repetitive activity. That might be something like swinging a tennis racket over and over, or – for many of us – hunching over our desks and pounding the keyboard day in and day out. So how can you get your freaked-out muscles to chill? Pressing on the muscle knots, called a trigger point self-massage, is a great place to start, Dr. Adams says. The simple pressure can help muscles relax. Find the tight spots (odds are you won’t have to look too hard). Use your fingers (or tools like foam rollers and massage balls) to press firmly into the trigger points. Repeat for three to five minutes, ideally as often as five or six times per day. “It needs to be part of the daily routine,” Dr. Adams says. How hard should you push? It varies. Some people can handle intense pressure; others are a bit more … delicate (no shame). Go ahead and dig in — it’s unlikely you’ll push hard enough to do any damage, Dr. Adams says. Still, it might not feel great in the moment. “Discomfort is part of the process,” he adds. But intense pain is not. 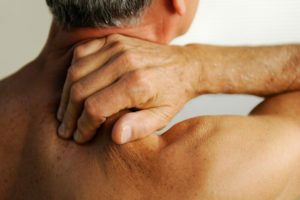 If you feel a sharp pinch or tingling, you might have an injury that goes beyond muscle tension. In that case, quit with the thumbs already and get yourself to a doctor. After each mini-massage, your muscles should feel looser. Over time, regular trigger point massages can help bring longer-lasting relief. But also think about what you can change in your environment to make your muscles happier. Could a better desk chair help your posture? Can you take breaks to stretch throughout the day? If you’ve made those changes, but the knots keep returning for an encore, it might be time to call in the pros. Consider seeing an expert such as a chiropractor, physical therapist or massage therapist. Above all, Dr. Adams advises, pay attention.